We are an Ilford IG1 carpet cleaning company specialising in cleaning all kinds of carpets. All of our carpet cleaners have passed the toughest qualifying exams and have years of experience in cleaning industry. Our carpet cleaning prices are competitive and affordable. Because of our modern and advanced cleaning equipment, we accomplish perfectly cleaned carpet every time. We use the latest carpet cleaning techniques from hot water extraction to dry carpet cleaning. No matter how big or small the project or how gentle or rough your carpets, we are certain we’ll be able to remove all the bacteria and stains from your carpets. All of our equipments are eco-friendly and our materials are biodegradable. So you can be completely sure that not only will your home be 100% clean but also healthy and 100% chemical-free. If you’d like to use our services or have further enquiries, please feel free to contact Magic London Carpet Cleaning in Ilford (IG1)! 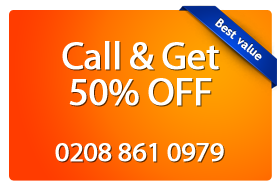 Call us on 0208 861 0979 and book service. If you have questions, our customer support lines are open 7 day a week for you convenience. Also you will get a free price estimate. Or you can use our on-line booking form.